You know that quantitative aptitude section is most important in bank exams in PO and Clerk and for other competitive exams because if you want good score in bank exam then you have to score good in maths. In competitive exams the most important thing is time management, if you know how to manage your time then you can do well in Bank Exams as well as in other competitive exams. That’s where maths shortcut tricks and formula are comes into action. So continuously we are providing shortcut tricks on different maths topics. Today’s topic is Simple Interest. This is the one of the most important topic in quantitative aptitude section in bank and SSC exam. 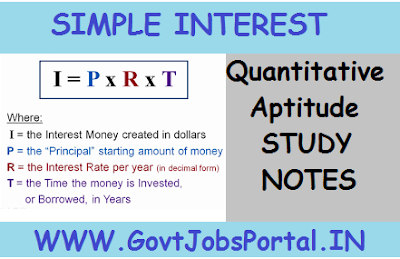 You should know how to simple interest questions and answers in very short time for bank exam. From this chapter around 1-2 questions are given in the SBI and IBPS exams. For this here we are providing shortcut tricks and quicker method to solve simple interest problems in very short time. Interest is the money paid by the borrower to the lender for the use of money lent. The sum lent is called the principal. Interest is usually calculated at the rate of so many rupees for every Rs 100 of the money lent for a year. This is called the rate per cent per annum. ‘per annum’ means for a year. The words ‘per annum’ are sometimes omitted. Thus, 6 p.c. means that Rs 6 is the interest on Rs 100 in one year. Interest is of two kinds, simple and compound. When interest is calculated on the original principle for any length of time it is called simple interest. Compound interest is defined in the next chapter. To find Simple Interest, multiply the principle by the number of years and by the rate per cent and divide the result by 100. Ex. 1. Find the simple interest on Rs 400 for 5 years at 6 per cent. When the time is given in days or in years and days, 365 days are reckoned to a year. But when the time is given in months and days, 12 months are reckoned to a year and 30 days to the month. The day on which the money is paid back should be included but not the day on which it is borrowed, i.e. in counting, the first day is omitted. Ex. 2: Find the simple Interest on Rs 306. 25 from March 3rd to July 27th at 15/4% per annum. Ex. 3: What sum of money will produce Rs 143 interest in 3¼ years at 2½ p.c. simple interest? Ex. 4: A sum of Rs 468.75 was lent out at simple interest and at the end of 1 year 8 months the total amount was Rs 500. Find the rate of interest per cent per annum. Ex. 5: A lent Rs 600 to B for 2 years, and Rs 150 to C for 4 years and received altogether Rs 90 from both as interest. Find the rate of interest, simple interest being calculated. Ex. 6: In what time will Rs 8500 amount to Rs 15767.50 at 4½ per cent per annum? Ex. 7: the simple interest on a sum of money is 1/9th of the principal, and the number of years is equal to the rate per cent per annum. Find the rate per cent. Ex. 8: A sum of money trebles itself in 20 yrs at SI. Find the rate of interest. Solution: Let the sum be Rs 100. Ex. 9: A sum was put at SI at a certain rate for 2 yrs. Had it been put at 3 % higher rate, it would have fetched Rs 300 more. Find the sum. Solution: Let the sum be Rs x and the original rate be y % per annum. Then, new rate = (y + 3) % per annum.